Bridge cameras are popular with people looking to make the transition from compact camera to more advanced shooting. They provide the manual functionality of a DSLR, without the bulk or hassle of changing lenses. Fuji announced the X-S1 this week and it has a number of interesting features - here are 10 things you should know about the camera, which will be on sale from February 2012. Incredibly long zoom lenses are often the stand out features of bridge cameras, with some, such as the Canon Powershot SX40 offering an incredible 35x zoom. While Fuji's camera is a little shorter at 26x, it does also offer Fujifilm's Intelligent Digital Zoom capability, effectively doubling the zoom range while, so says Fuji, keeping the same quality. The Fujifilm X10 is Fuji's latest retro styled fixed-length lens camera to hit the market after the popularity of last year's X100. The X-S1 features the same 2/3 inch 12 million pixel EXR CMOS sensor as the X10, which Fuji claims can deliver excellent low light performance. The X-S1 has an impressive sensitivity range of between ISO 100 and ISO 3200, which is expandable up to a hefty ISO 12800 when shooting in the small JPEG format. Fuji claims that the low light performance of the camera is impressive, and with high sensitivity speeds such as this, we'll be keen to put it through its paces in due course. In standard shooting mode, the X-S1 can only focus as close as 30cm, but engage Super Macro Mode and objects as close as 1cm away from the camera lens can be shot in extreme close-up for frame-filling images. Unlike some of its competitors, Full HD video recording at 1080p is available on the X-S1. It also uses stereo sound and can shoot at 30 frames per second. The trend for articulating and tilting LCD screens isn't going away, and here on the X-S1, the three inch 460,000 pixel LCD can be tilted and also comes with a daylight mode to help eliminate glare when shooting in the sunlight. Bridge cameras are a great way to learn about the more complicated techniques in photography, and the X-S1 provides a full array of manual modes, including Program, Aperture and Shutter Priority as well as fully manual. Interestingly for a bridge camera, the X-S1 has the capability of shooting in raw format. This is a great benefit and could see the camera have the edge over other bridge cameras that have neglected to include this feature. Thanks to the high-speed EXR processor, the X-S1 can shoot full-resolution images at up to 7fps, increasing to 10fps if you're willing to reduce the quality to a 6 megapixel resolution. While it can't quite match up to the 10.3fps at full resolution shooting of the Canon Powershot SX40, it should still be good enough for the needs of most photographers. If you just want to concentrate on composition or family photos, the X-S1 also comes with an advanced Auto EXR mode which is capable of detecting the scene in front of it and applying the appropriate settings. 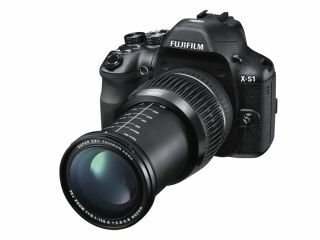 The Fujifilm X-S1 UK price will be £699, and will be available from February 2012.